After last year’s representative got swept, this year’s representative did the sweeping. The 25th-seeded ’83-’84 Washington Capitals swept the 40th-seeded ’79-’80 Colorado Rockies by outscoring them 22-8 over the four games. Found in this post’s featured image, Bengt-Ake Gustafsson scored five goals in the series to tie with Alan Haworth for the team lead. Three players were tied for second with two goals, including Bob Carpenter, who led Washington in assists with seven. Defenseman Scott Stevens was second behind Carpenter with six assists, but to the surprise of no one, he became the first player in the 2015 Ultimate NHL Playoff to be ejected when he got a match penalty for a cross-check in the middle of Game 4. So, congratulations. Carpenter also led the Caps in points with nine. Gustafsson was tied with Mike Gartner for second in points with seven. Gustafsson was also tied with Stevens and Gaetan Duchesne for the team lead in plus/minus at +7. Five players posted a +5 rating to be tied for second. In net, Al Jensen had a solid series despite a lack of action as he posted a 2.00 goals against average with a .922 save percentage while just facing just 25.5 shots per game. I’ll make this quick. Rene Robert led the Rockies in goals with three while Ron Delmore was second with two. Wilf Paiement, Rob Ramage and Pat Hickey all tallied two assists to tied for the team lead. Then, Delorme, Paiement and Robert were tied for the team lead in points with three. Only three players for the Rockies posted a plus/minus rating that was not negative. One of them was defenseman Joel Quenneville who posted an even plus/minus rating in three games. The goaltenders for Colorado posted some decent save percentages with starter Hardy Astrom posting a .912 save percentage and backup Bill McKenzie posting a .925 save percentage (1 game). However, their goals against averages were not decent at 4.75 and 3.00, respectively. 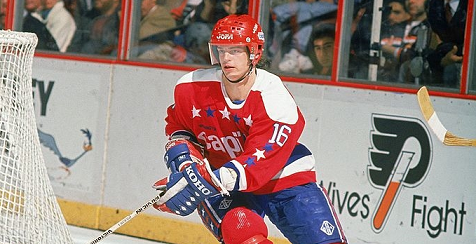 The ’83-’84 Washington Capitals are now the first Caps team to advance from the First Round after a disappointment in the inaugural tournament. The Rockies franchise has now been swept in the First Round of both Ultimate NHL Playoffs. The 25th-seeded ’83-’84 Caps now advance to play the 8th-seeded ’81-’82 New York Islanders in the Second Round! Up next in the First Round are the 31st-seeded ’84-’85 Winnipeg Jets and the 34th-seeded ’84-’85 Quebec Nordiques! This entry was posted in 1st Round, Ultimate NHL Playoff and tagged Al Jensen, Alan Haworth, Bengt-Ake Gustafsson, Bill McKenzie, Bob Carpenter, Colorado Rockies, First Round, Gaetan Duchesne, Hardy Astrom, Joel Quenneville, Larry Murphy, Mike Gartner, Pat Hickey, Rene Robert, Rob Ramage, Rod Langway, Scott Stevens, Ultimate NHL Playoff, Washington Capitals, Wilf Paiement. Bookmark the permalink.